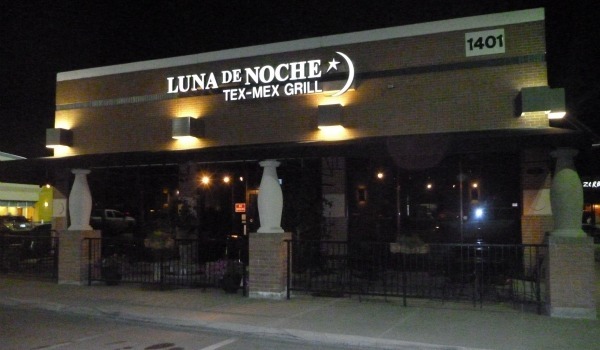 We had a great meal at Luna De Noche Tex-Mex in Plano. The restaurant has a very elegant decor. However, they are also kid-friendly and offered great menu selections for our little ones. We had never been to Luna De Noche before but we chose them because we had a Restaurant.com dining certificate for $25 off our meal there. She Is Dallas info: Luna De Noche has several locations in the DFW area including Garland at 7602 N. Jupiter @ Lookout in Garland, 7927 Forest Lane in Dallas, 8687 N. Central Expwy. #1804, 1401 Preston Rd., 2300 Victory Park Lane in Dallas, and 2095 Summer Lee Dr. #105 in Rockwall. For more information and to view their menu please visit the Luna De Noche website. You can also follow them on Facebook and Twitter. I tried one of the newest additions to the menu, Carne Al Horno Tacos. 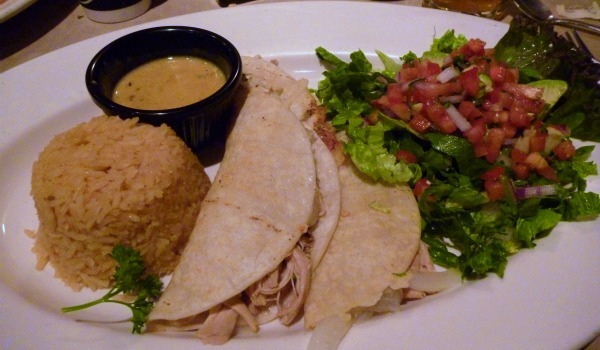 Three white corn tortillas grilled in butter and filled with Monterey Jack cheese, sautÃ©ed yellow onions and well seasoned shredded beef (or chicken), served with Mexican rice, a choice of beans, choice of homemade sauces and avocado pico de gallo. They have an impressive list of sauces and we all know that sauces can make or break the dish. The Moon Rise sauce really pulled all the flavors together for me. This sauce has a little kick to it because it is made with pureed grilled jalapeÃ±os, onions, tomatoes and fresh cilantro mixed in a chile con queso sauce. My husband ordered the Chimichanga. 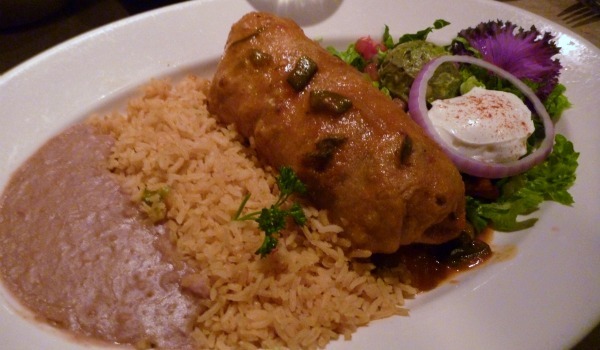 It was a large crispy flour tortilla filled with fajita beef and grilled onions and the sauce of your choice as well as rice, beans, guacamole and sour cream. It typically has cheese inside it as well but my husband ordered it without cheese and it arrived just as he ordered it without any problems. The food was really great and I look forward to returning again. However, we did not care for the flavor of the Spanish rice or the refried beans. Next time we’ll order the Luna rice to go with our meal. It has jalepenos and cilantro in it. Yum! What was really great about this meal is that we saved a bunch of money on it by purchasing a dining certificate through Restaurant.com before we went. They typically can offer savings of around 50% off your meal. However, I recently took advantage of a sale they had and got a $25 dining certificate for Luna De Noche for only $2.00! 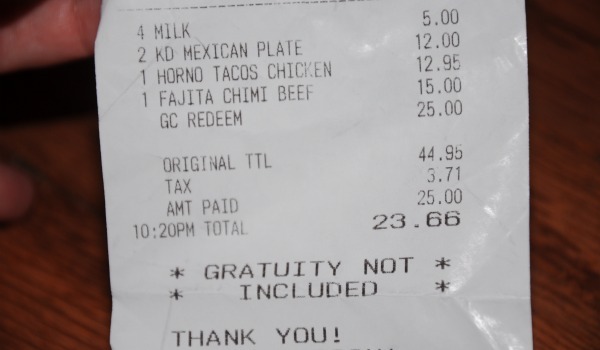 As you can see below, our bill after tax was $48.66 but with my dining certificate it only cost us $23.66! Be sure to check out our other post on how you can save money on dining out by using Restaurant.com. I think I was born eating Mexican food. For real!